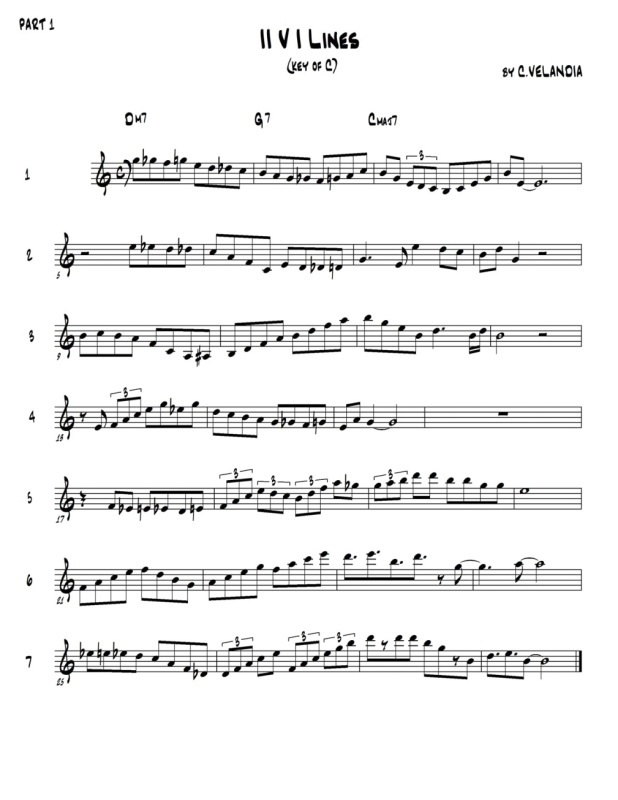 As you may or may not know, the II V I is arguably the most common chord progression in Western music.It is one of the main principles of music, as it is based on the idea of TENSION to RESOLUTION.The sheet above consists of lines primarily useful for jazz improvisation over a II V I progression in the key of C (which refers to the degrees of the chord; the II being Dm, V being G7, and I being C). If you listen to jazz enough you will notice that the "jazz" scales seem to have more notes than the regular scales. These notes are the notes in between the actual scale-notes, and they are used as passing notes. Let's take a look at Example 1, bar 1. Immediately, we notice there is a Gb and a Db....two wrong notes! Really? Maybe not. If we were to hold a Gb or a Db against a Dm7 chord, we could get two really off-sounding notes, as they are the major 3rd and the major 7 of the minor chord. However, if you take a close look at their direction, they are being used as passing notes between the note that came before and the note that comes after. The Gb is placed between a G natural and an F. The Db is placed between a D natural and a C. Now as we play the phrase, it doesn't sound so bad, does it? 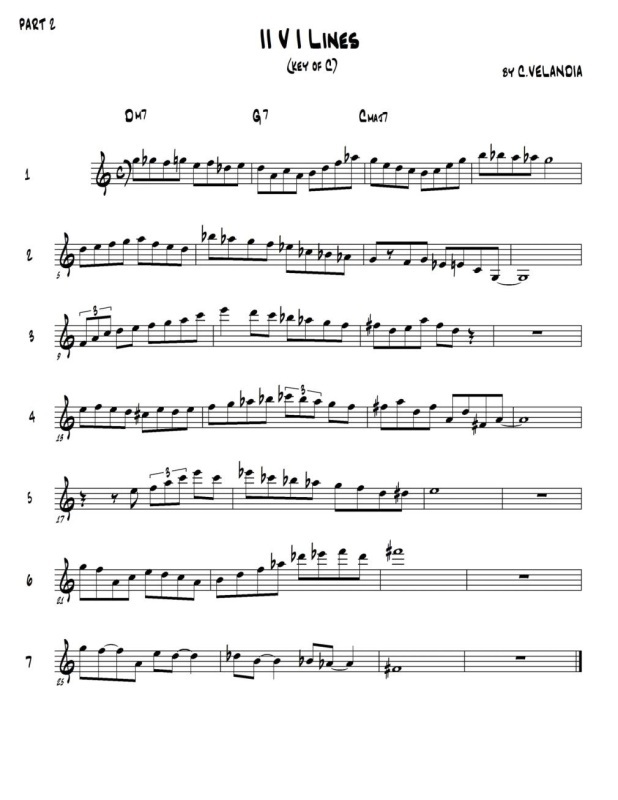 Jazz musicians use this method of chromaticism in their lines to give it a more interesting sound than if they were just playing regular scale degrees, which get boring real soon. Now if you take a look at Exercise 4, bar 1, we have an Eb and there are two G's on either side. Passing notes don't always have to be followed by a chord tone right away, but eventually resolve; TENSION to RESOLUTION. Passing notes are usually played on weak beats, like up beats. Keeping the chord tones on the strong beats is a good step to a good melodic line. Try to write out your own II V I lines and see what you come up with. Also, pay close attention to where I started and ended each line. Make sure you are conscious of where your lines start and end. If you start your line on beat one, make sure its not by accident. Starting and ending in different places is another step to make interesting lines. Hopefully by now you've gotten comfortable with the first part of the II-V-I lesson. In Part 1 of the lesson, I mentioned altered chords and upper extensions. This is where it'll come into play. In addition to passing tones, we can add upper extensions of the chord into the lines. Before we were looking at the V chord as a regular G7 (1, 3, 5, b7). On Example 1, I've implied a G7b9. Meaning we are adding another chord tone. Our new note, Ab is the b2 from G. However, every time we have a b7 in the scale, any 2nds are going to be referred to as 9ths, any 4ths will be referred to as 11ths, and any 6ths will be referred to as 13ths. These are called upper-extensions. If you look closely, the Ab of G7 can lead us into either the G in C, which is the 5th, or the A in C which is the 6th. So even though we have a note that is not in our basic key of C, it is only a half-step away from a "right" note on either side. We can take that idea even further to say that there is a right note on either side of any wrong note!! But now, here is a question: Is there such thing as a wrong note? If we take a look at Example 2, we have four "wrong" notes on our V chord....that's as many wrong notes as we have right notes! Let's break it down. Since we have a #9, a b9, and a #5 altogether, we can't refer to this as a G7#9b9#5. We are simply going to call it a G7 altered. When we have a V chord, we can alter any (or all) of the upper extensions. The only note we can't alter on a V chord is the 7th. The 7th degree must remain flat or else it would be a major 7 chord instead of dominant (b7). Our V chord is always dominant. So here's is our V chord with all its possible alterations. Our II chord stays the same, our V chord can be altered, now let's look at a new option for our I chord. In Example 3 and Example 4, I introduced an F#. This is our #11 (or #4). Whenever we raise the 4th degree of a scale, we refer to it as lydian. The #4th is a much more resolved sound than the natural 4th on a major I chord. In fact, the natural 4th is referred to as an avoid note. This means you use the note like a passing note and it is better to avoid staying on it specially on strong beats. A good way to imply the lydian sound is by playing the triad of the whole step above (D), as seen in Example 4, measure 3. Now if we look at those notes starting from in relationship to G, we have the b5 or #11, the b7, and the b9. Now I'll tell ya, playing the #11 and the b9 on a dominant chord will give you a real outside sound, one of my favorites! So now when you practice your II, V, I, practice placing some of the altered notes over the V chord and maybe the #11 on the I chord. See what you can come up with!